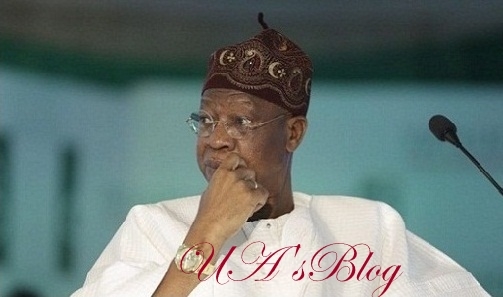 A suit has been filed against the Minister of Information, Alhaji Lai Mohammed, by an Abuja based lawyer, Johnmary Jideobi, over an alleged ‘false’ claim he made on the suspended Chief Justice of Nigeria (CJN), Walter Onnoghen. The Minister had alleged that Onnoghen ran a suspicious transaction running into dollars. The suit, which was filed by the plaintiff, on Tuesday has Lai Mohammed as the sole defendant. “Whether or not upon a dispassionate reading and complete understanding of Rule 1 of the Rules of Professional Conduct for Legal Practitioners 2007 [enacted by the General Bar Council pursuant to the Legal Practitioners Act] vis-à-vis the affidavit of the Plaintiff, the Defendant has failed to maintain a high standard of professional conduct and engaged in conducts unbecoming of a legal practitioner. “Whether or not upon a dispassionate reading and complete understanding of Rule 1 of the Rules of Professional Conduct for Legal Practitioners 2007 [enacted by the General Bar Council pursuant to the Legal Practitioners Act] vis-à-vis the affidavit of the Plaintiff this is not a deserving case for this Honourable Court to refer the Defendant to the Legal Practitioners Disciplinary Committee for disciplinary action? “Upon the determination of the above question, the plaintiff is, therefore, seeking a court declaration, that upon a dispassionate reading and complete understanding of Rule 1 of the Rules of Professional Conduct for Legal Practitioners 2007 [enacted by the General Bar Council pursuant to the Legal Practitioners Act] vis-à-vis the affidavit of the Plaintiff, the Defendant has failed to maintain a high standard of professional conduct and engaged in conducts unbecoming of a legal practitioner. Consequent upon this, Mr Jideobi is seeking an order of court “committing the Defendant forthwith to the Legal Practitioners Disciplinary Committee [LPDC] for proper disciplinary action”. He also seeks a public apology from Mr Mohammed.